Unlike cow’s milk there is no need to homogenize goat’s milk. While the fat globules in cow’s milk tend to separate to the surface, the globules in goat’s milk are much smaller and will remain suspended in solution. 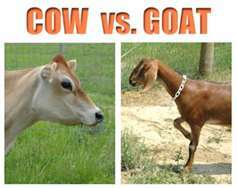 When individuals have sensitivity to cow’s milk, goat’s milk can sometimes be used as an alternative. In a study from the University of Granada in Spain of last year, ‘Goat’s milk may boost iron absorption more effectively than cow’s’. The study also found goat’s milk contained higher levels of zinc and selenium, which help the immune system. It has also found goat’s milk contained a significant amount of oligosaccharides, compounds that reach the large intestine undigested and act like prebiotics, enhancing the growth of healthy ‘probiotic’ gut flora that wards off infections. However, when it comes to vitamin B12, which is important for the formation of healthy red blood cells, cow’s milk wins hands down. ‘Half a tumbler of cow’s milk contains nearly two thirds of the recommended daily intake, you’d have to drink nine times that amount of goat’s milk to get the same levels,’ says Lowe. Some children given goat’s milk have been found to have B12 deficiency, symptoms include fatigue and weakness. Furthermore, goat milk patrons claim that those with an allergy to cow’s milk can happily pour goat’s milk on their cereal. But this may not be the case, according to Lowe. If you have an allergy to cow’s milk, around five per cent of the UK population is thought to be affected, you’re likely to have a similar response to goat’s milk, and sheep’s milk, too. ‘The protein that causes an allergy is very similar in all these types of milk,’ says Lowe. However, some other initial studies suggested that specific proteins known to cause allergic reactions may have been present in cow’s milk in significant quantities yet largely absent in goat’s milk. Allergy to cow’s milk has been found in many people with conditions such as recurrent ear infections, asthma, eczema, and even rheumatoid arthritis. Replacing cow’s milk with goat’s milk may help to reduce some of the symptoms of these conditions. People who claim to be intolerant to lactose, the natural carbohydrate in milk, often swap cow’s for goat’s milk. Instead those people with a lactose intolerance should opt for a dairy-free alternative such as soya milk. But could goat’s milk help you shed the pounds when it has less calories than that of cow’s? It’s true that its fat globules are generally smaller than those in cow’s milk so the body’s digestive enzymes can break it down more rapidly, however, there’s no confirmed link with reduced abdominal bloating. There’s been a 40 percent rise in demand for goat’s milk for children in recent years, the result of an increase in the numbers said to be either allergic to dairy or unable to digest it. Unfortunately, goat’s milk is lacking in several nutrients that are necessary for growing infants , the proteins are too concentrated for young children to digest and some sources of it are unpasteurized, raising the risk of bacterial infection, diarrhea and sickness. But for older children and adults, however, goat’s milk can be an excellent calcium-rich alternative to cow’s milk as, in addition to calcium, it contains many of the same nutrients found in cow’s milk. According to the Department of Health, ‘Infant formulas and follow-on formulas based on goats’ milk protein have not been approved for use in Europe’.